A forty year old man, Philip Mensah in a quest to fortify himself was made to spend six years sleeping at the cemetery in accordance with directives from a spiritualist, and is now addicted to sleeping in graves. According a news report by Koforidua-based Bryte FM a spiritualist at Anum Boso in the Eastern Region directed Mensah to relocate to a broken tomb for the stipulated period if he was indeed prepared to be powerful. “My desire was to gain powers that will enable me to discover hidden secrets like; how to tell when one will die, what is to befall someone in the future, how to retrieve stolen items, how to make spiritual money, among many others. 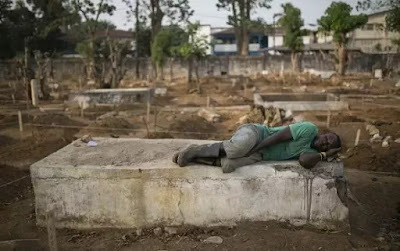 I heeded to the advice of Togbe Azakli, who directed me to spend six years of my life with the dead in their broken tombs, since that is the only way I could attain the spiritual powers I have desired for over the past years,” Mensah disclosed. But he revealed upon completing the task by the spiritualist, he has rather become addicted to sleeping in graves. “Life is now unbearable for me because I cannot even stay with the living and make money out of the powers I have attained. I wish to be exorcised from this current situation but all efforts have proven futile,” he told the reporter.